Have you been inspired today? I always see or read things online that inspire me. There are so many yummy recipes, creative crafts and home DIY projects that I want to try, but I don't often get to put my plan into action. 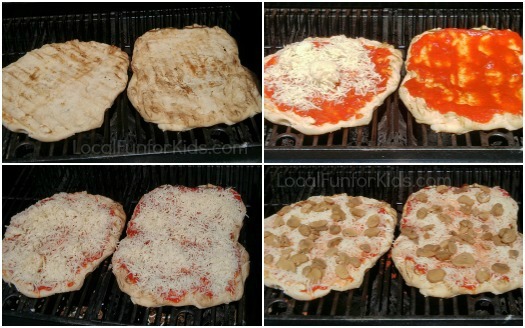 Lately, I've seen some different recipes for grilled pizza and they looked amazing. So, I gave it a try and my family loved it! I used pre-made pizza dough from Trader Joes. When you grill pizza dough it makes it really nice and crunchy. Too many times, I've given a slice of pizza to my sons and ended up cutting it up on a place. That is not the case with grilled pizza! The crust is light and crispy which makes it great for kids. As soon as the dough was cooked on the underside, I quickly flipped it and added my toppings. I kept the grill on low heat, and luckily, the crust came out perfectly and all of the cheese melted nicely. A big reason to love grilled pizza is because the mess is all kept outside. Whenever we've made pizza inside, there are little bits of cheese that don't make it onto the pizza. Doing it this way, I didn't need to clean up anything in the house, and I was able to watch my kids in the yard while I was cooking. This perfect for those summer afternoons when they want to do anything but come inside. The pizza was a success! My son didn't want his picture taken, but he was more than happy to show off his slice of mushroom, basil and oregano pizza. We will definitely be making this again! Do you want to try it? Stephanie, from Confessions of a Stay-at-home Mom, has a video that shows you exactly how to make grilled pizza. If you've never made pizza on your grill before you definitely want to check it out. What's your favorite thing to grill in the summer?